The ASF DAAC’s RTC Stacking Tool helps facilitate time-series analysis. A new open-source tool created by NASA’s Alaska Satellite Facility (ASF) Distributed Active Archive Center (DAAC) facilitates time-series analysis of synthetic aperture radar (SAR) imagery. Stack of processed GeoTIFF Sentinel-1 imagery of the Yukon River flats near Beaver, Alaska, created using the RTC Stacking Tool. Image: ASF DAAC 2019, contains modified Copernicus Sentinel data 2017-2018, processed by the European Space Agency. 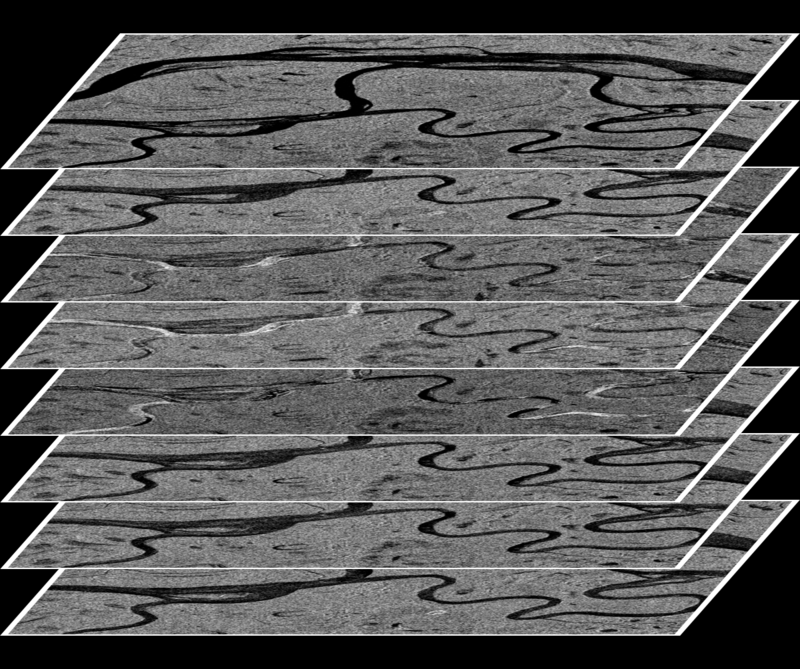 The Radiometrically Terrain Corrected (RTC) Stacking Tool uses ASF DAAC’s Hybrid Pluggable Processing Pipeline (HyP3, pronounced “hype”) system to create a stack of images from a set of Sentinel-1 RTC products. In fact, the tool can accept any Universal Transverse Mercator (UTM)-projected co-registered set of images, such as a co-registered set of RTC products from the Japan Aerospace Exploration Agency’s Phased Array type L-band SAR (PALSAR) instrument, which also are archived and distributed by ASF DAAC. Once a stack of imagery products is created, the RTC Stacking Tool allows the user to perform sub-setting, resampling, grouping, filtering, and culling on the stack. The final products are a stack of processed GeoTIFF images and an animated GIF of the stack. SAR is an active radar technology that senses microwave signals reflected off Earth’s surface, which means SAR imagery can be created day or night and in virtually any kind of weather. The result is cloud-free, high-contrast imagery. After the radar sends its microwave signal toward a target, the target reflects part of the signal back to the radar antenna. This reflection is called “backscatter.” Various properties of the target (land, water, trees, etc.) affect how much the target backscatters the return signal. Radiometric correction involves mitigating the influence of topography on backscatter values. In an ASF DAAC example, the correction eliminates bright backscatter from a steep slope, leaving only the backscatter that reveals surface characteristics such as vegetation and soil moisture. Terrain correction is the process of correcting geometric distortions that lead to geolocation errors. These distortions are caused by side-looking (rather than straight-down looking) imaging, and are compounded by rugged terrain. Terrain correction moves image pixels into the proper spatial relationship with each other. Collectively, the RTC process further enhances the sharpness and accuracy of SAR imagery and makes it easier to use SAR imagery with other types of imagery. NASA’s ASF DAAC archives and distributes SAR imagery in the NASA collection. Some of this imagery is produced by international space organizations and distributed by ASF DAAC through intergovernmental agreements. This includes imagery from the European Space Agency’s Sentinel-1A and -1B missions and from the PALSAR instrument aboard the Japan Aerospace Exploration Agency’s Advanced Land Observing Satellite-1 (ALOS).